If you are a care or service provider of any type—maybe you work with children or the elderly, or your job is as a corrections officer or security guard, or perhaps you are someone who works in a school setting—you have probably experienced a wide variety of challenges that have left you wondering if you are in the right field. The truth is, any profession that calls you to work with the public has potential health risks; it’s always a good idea to be prepared to meet those risks head on and keep them from causing you or someone else harm. The first defense against becoming infected is to learn all that you can about bloodborne pathogens and why the improper handling of blood can be dangerous to your health. First, know that employers are required by law to provide each employee with proper equipment and education to ensure protection; if you don’t already know how your employer is abiding by the OSHA standard, ask until you get the answers you need. You also may consider taking a HeartSaver Bloodborne Pathogens course to receive clear instruction and certification on the best ways to keep yourself and others safe. When taking a HeartSaver Bloodborne Pathogens course, you will learn about Personal Protective Equipment (PPE). Using the proper equipment can make all of the difference in prevention against bloodborne pathogens. Wearing gloves any time you’re encountering bodily fluids is the first line of defense against contracting these illnesses. Gloves should be worn not only when providing care and first aid but also when handling soiled clothing or changing bedding, when cleaning contaminated surfaces, and when removing trash that contains bodily fluids. Also, if possible, masks and goggles should be worn to protect your eyes, nose, and mouth from being contaminated by fluids that may splash on you, potentially entering your respiratory system and/or blood stream. Just like you learned in grade school, washing your hands should never be an optional thing but instead a frequently repeated occurrence–especially when you are a person who has the potential for exposure to others’ bodily fluids. When taking a HeartSaver Bloodborne Pathogens course, you would learn that washing your hands (and any other contaminated skin) is essential; using soap, water, and a vigorous scrubbing method could be the difference between contracting a bloodborne illness and staying healthy and sickness free. According to the OSHA standard, employers are required to provide easily accessible hand washing stations for each employee; if you don’t know where these stations are in your workplace, ask a supervisor. Maybe it goes without saying, but how you dispose of the contaminated materials is just as important as using it properly. Before leaving the area you were working and using the PPE, be sure to remove all equipment (gloves, masks, etc.) and properly dispose of them. Your employer should provide an appropriately labeled storage area or containers to clean, decontaminate, or dispose of all used materials. Refer to the specific information detailed by your employer as well as the instruction learned in a HeartSaver Bloodborne Pathogens course. Remember that all of the equipment, training, and instruction in the world will do you no good if you don’t put what you have learned to good use. Using common sense simply means take a moment to stop and assess the situation, determine the best course of action, and to use the provided materials to end any potential danger and provide necessary care. Take the HeartSaver Bloodborne Pathogens course to feel confident in your ability to handle the situation. Protect yourself from bloodborne pathogens; Act when exposed to blood or contaminated materials; Clean yourself and the affected area to eliminate the risk of infection; and Tell your employer anytime there is a situation of exposure in your workplace. 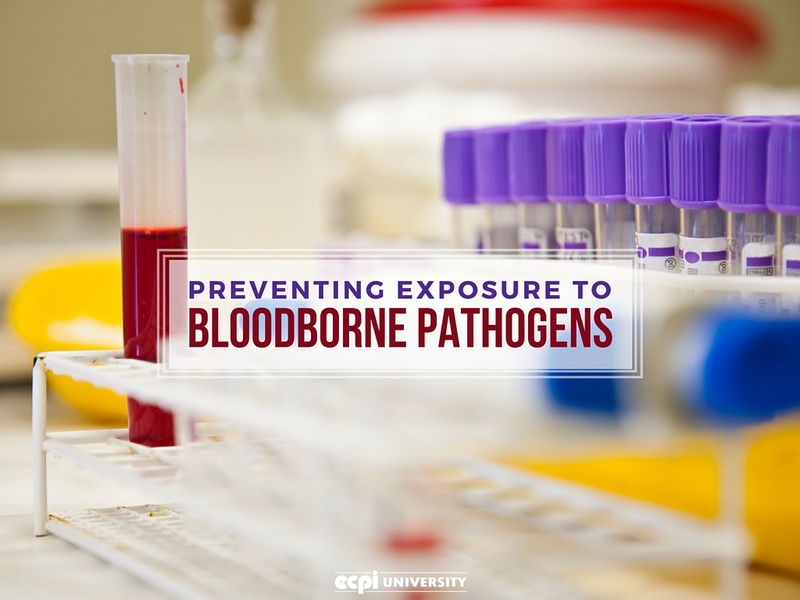 Knowing how to prevent exposure to bloodborne pathogens can make a critical difference in whether you find yourself protected or endangered by potential illnesses. If you are in a service-related job, or you just want to be prepared in the case of emergencies, consider taking a HeartSaver Bloodborne Pathogens course with ECPI University’s Professional Development Center.